Uglyworld #648 - Goodies For The Journey (196-365), originally uploaded by www.bazpics.com. Babo has been a great help all week helping to get things organised for me heading away, and today he took charge of the case packing activities, assisted by all the other little guys who were comical as they stood in line holding various pieces of clothing for Babo to pack into the case one by one. 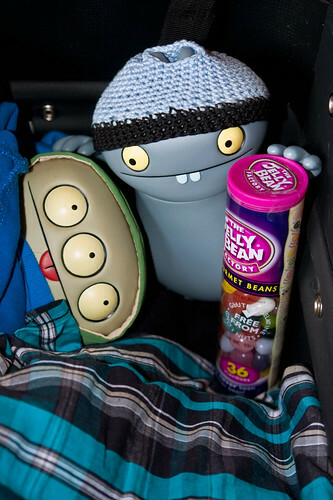 Cinko had been a little upset at the fact that he had to travel in my case, but Babo came to the rescue with some "goodies" for the journey, needless to say Cinko was over the moon at the Jelly Bean's Babo made sure to pack within easy reaching distance of him. So much to do, so little time (so sorry to those of you that I normally check in on here, hopefully I'll get some more time once over in America to check out your latest work! ), I'm just glad I've this great bunch of uglies here to help out when there seems like a never-ending list of things to be done. Cinko has promised that he'll not touch the jelly beans until he's been checked into the plane, but somehow I expect he'll have munched them all long before then!! !